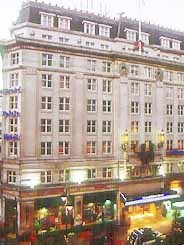 The Strand Palace boasts one of the most central locations in London.. Within a few minutes walk you can reach most of London's theatres, the Opera House, Covent Garden, the Guild Hall, Whitehall, Trafalgar Square, Soho, Waterloo Bridge, the South Bank Arts Centre, the Royal Festival Halls, Big Ben and Parliament buildings. The hotel has been carefully modernized in order to allow the guests to experience the latest standards of comfort . 372 THE STRAND is an International menu and English carvery buffet restaurant with an impressive display kitchen where you can watch your meal being prepared. JOHNSTON'S CAFE & BAR offers a lively split level cafe and bar whilst serving a selection of grills, burgers, salads and sandwiches. The Hotel offers a total of 783 comfortable rooms on nine floors. Options include standard single, double and twin bedrooms and upgraded Club rooms. Non smoking and inter-connection rooms are available upon request. All bedrooms have colour TV with remote control, free satellite channels, pay movie channels, answerphone, tea and coffee making facilities, hairdryer, trouser press and 24-hour room service. BIANCONE RESTAURANT... Our friendly Italian bistro serves a variety of pastas, pizzas and authentic regional specialities. BIANCONE BAR is the perfect place to enjoy an exotic cocktail or a warming malt whiskey. HOPS! BAR is perfect for a party with its live bands. It is also an ideal venue for pre or post theatre bar meals which have a Tex-Mex theme.